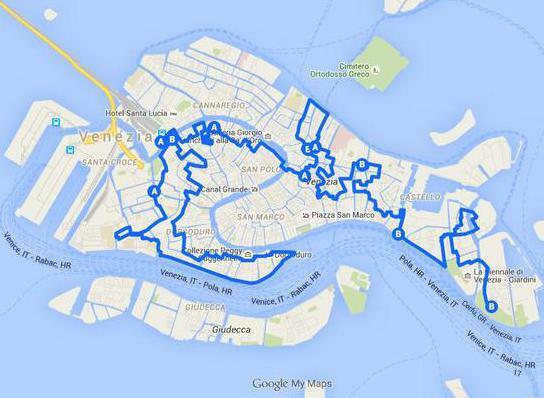 The nordic walking march in the historical centre of Venice, crossing bridges, "calli" (roads) and "campielli" (small squares), is now at its 5th edition. • Two tracks, 10Km and 17 Km; NEW TRACKS! Into the heart of Venice through unknown roads, different than last year! • For both tracks, finish line at Giardini di Sant'Elena, where a tasteful Pasta Party will be offered for free in the very special scenery of the lagoon! • Free private toilets at departure, refreshment stations and arrival! • Free private water buses will take walkers back to the start! The short track, which is a part of the long track, will lead you into the heart of Venice; after the start, after crossing the Ponte degli Scalzi in front of the station, walkers will divide into two groups: a group to the right for 17-K track, another group straight ahead for the 10-K track. The path will lead to Rialto Bridge, to the Chiesa dei Gesuiti and then to Fondamente Nove. The refreshment point will take place in Campo San Lorenzo. At the arrival tasting of Venetian specialities, according to the theme of Expo 2015: healthy food and correct life style.